On this Veterans Day and everyday we would like to honor those who have served and are still serving in the military. Recently we had a huge baby shower where we collected baby items for expectant mothers whose injured spouses are recovering at 29 Palms, Camp Pendleton, and the San Diego Naval Hospital. 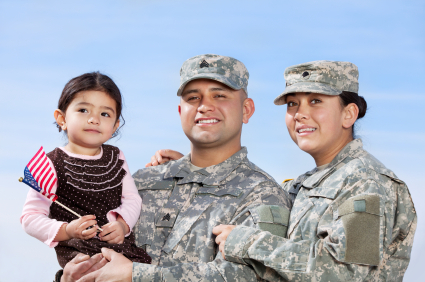 Today Ginita Wall would like to share some well-deserved tax breaks with our heroes. Military members and families, we salute you this Veterans Day. So does Uncle Sam, by providing some well-deserved tax breaks. Though as a general rule all income is taxable, if you serve in the military some of your income is excluded from taxation, due to special rules just for you. If you serve in a combat zone for any part of a month, your income for that month is exempt from federal taxes. Use that tax break to maximum benefit by taking the money you would have spent on taxes and using it for contributions to an Individual Retirement Account (IRA). Since your IRA can grow tax deferred until you withdraw the money, that will really give you a leg up on creating a secure future retirement. Want to make it even better? Since you won’t need a tax deduction for the contribution, consider putting the money into a Roth IRA instead of a traditional IRA, and you’ll never have to pay tax on the earnings. You can make a 2012 IRA contribution and a spousal IRA contribution until the April 15, 2013 tax filing deadline, plus any applicable extensions. Your can also increase your contributions to your federal Thrift Savings Plan. For any period you are serving in a combat zone, you may invest as much as $50,000 rather than the normal $17,000 limitation. If you receive uniforms or a uniform allowance, that isn’t taxable income to you. Neither are moving and storage expenses provided by the government, legal assistance, commissary discounts, professional education, survivor benefit and life insurance premiums, and basic allowances for housing and assistance. Travel allowances are not taxable, either, including transportation for you and your family during ship inactivation, per diem travel allowances, leave between overseas tours, space-available travel on government aircraft, and round trip travel for dependent students. Medical and dependent benefits provided by the military aren’t taxable, including medical and dental care and dependent-care assistance program coverage. You can also exclude reenlistment bonuses, pay for accrued leave and student loan repayments. If you are a military reservist, you can take early withdrawals from IRA and 401(k) accounts without penalty if you meet certain conditions. To qualify for this exemption, you must have been called to active duty after Sept. 11, 2001 for more than 179 days, and you must make the withdrawal while you are on active duty. If you are a member of the reserves, you can deduct your unreimbursed travel expenses in connection with your service as an adjustment to income and you don’t have to itemize your deductions, as long as the travel was more than 100 miles from home. Reservists who are prohibited from wearing certain uniforms when off duty can deduct the cost to buy and maintain those uniforms, reduced by any uniform allowance or reimbursement received. Members of the military serving in combat zones get an automatic 180-day extension from the IRS for filing tax returns, paying taxes and filing refund claims. The automatic extension also applies to making qualified contributions to an IRA. If you are serving away from home, your spouse can use a power of attorney to file a joint return on your behalf. Hopefully these tax tips will help you understand the additional tax benefits available to you and if you need help or have questions TurboTax has CPAs to help answer your questions year-round.